24. 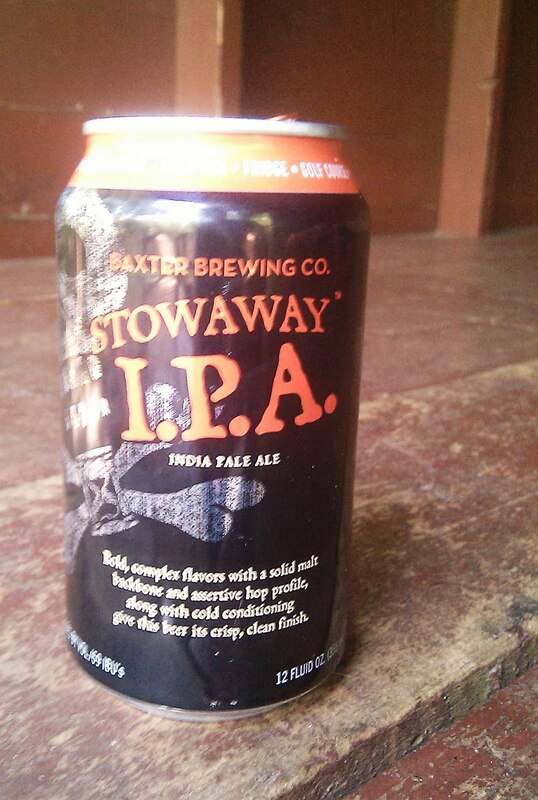 Baxter Brewing Stowaway I.P.A. If you have been following my blog you know that IPAs are not my favorite beer. This is better than some of the other IPAs tried but still not my favorite beer. The IBU rating on this one is 69 which I believe is the highest rating to date and you can certainly tell the difference. If you like IPAs I am sure you would enjoy this beer. Brewers Description: Bold, complex flavors with a solid malt backbone and assertive hop profile, along with cold conditioning, give this beer its crisp, clean, hoppy finish. Flavor Profile:Deep amber-to-orangish in color; pours with a nice, creamy head; huge hop aroma of citrus, pine and grapefruit rind notes with a big, complex, and intense hop flavor that lingers for a very long time. The malt flavor up-front turns dry and crisp; full bodied and a dry finish with a pleasant, long lasting, hop aftertaste and beautiful lace left in the glass. Stowaway leaves you wanting more.